The term livery originated in the specific form of dress worn by retainers of a nobleman and then by extension to special dress to denote status of belonging to a trade. Livery companies evolved from London's medieval guilds, becoming corporations under Royal Charter responsible for training in their respective trades, as well as for the regulation of aspects such as wage control, labour conditions and industry standards. Early guilds often grew out of parish fraternal organizations, where large groups of members of the same trade lived in close proximity and gathered at the same church. Like most organisations during the Middle Ages, these livery companies had close ties with the Catholic Church (before the Protestant Reformation), endowing religious establishments such as chantry chapels and churches, observing religious festivals with hosting ceremonies and well-known mystery plays. Most livery companies retain their historical religious associations, although nowadays members are free to follow any faith or none. Companies often established a guild or meeting hall, and though they faced destruction in the Great London Fire of 1666 and during World War II, thirty-nine companies maintain their sometimes elaborate and historic halls. Most livery companies still maintain contacts with their original trade, craft or professional roles. Some still exercise powers of regulation, inspection and enforcement, while others are awarding bodies for professional qualifications. The Scriveners' Company admits senior members of legal and associated professions, the Apothecaries' Company awards post-graduate qualifications in some medical specialties, and the Hackney Carriage Drivers' Company comprises licensed taxi drivers who have passed the "Knowledge of London" test. Several companies restrict membership only to those holding relevant professional qualifications, eg. the City of London Solicitors' Company and the Worshipful Company of Engineers. Other companies, whose trade died out long ago, such as the Longbow Makers' Company, have evolved into being primarily charitable foundations. After the Carmen received City livery status in 1746 no new companies were established in London for 180 years until the Master Mariners in 1926 (granted livery in 1932). Post-1926 creations are known as modern livery companies. The Worshipful Company of Arts Scholars, the newest, was granted livery status on 11 February 2014, making it the 110th City livery company in order of precedence. The Honourable Company of Air Pilots is exceptional among London's livery companies in having active overseas committees in Australia, Canada, Hong Kong, New Zealand and North America. From the 1870s however, there was a revival, with the companies extending their original educational purpose to technical education, supporting new industries and providing the training necessary to them, most notably the City and Guilds of London Institute. Finally, the companies have always been essential to the governance of the City of London. The senior members of the livery companies, i.e, the liverymen, elect the City's sheriffs, Bridge Masters, Ale Conners, auditors, the members of the City Livery Committee, and approve the aldermanic candidates for election to the office of Lord Mayor of London. By apprenticeship. This is now rare. In earlier days, someone wishing to enter such a trade would bind themselves apprentice to a member of their chosen trade. As such, he was required to do precisely as he was instructed, and it was almost a form of slavery – but the apprentice did learn his trade, and his master was required to provide such training that, at the end of the apprenticeship (usually seven years) the apprentice would be sufficiently knowledgeable to become a member – and he became a free man of the City of London – free of the obligations of apprenticeship. Regardless of method of entry, membership carries the same duties and benefits. Membership of a livery company conveys the Freedom of the City of London, now little more than a formality, though in the past the freedom carried benefits, such as being able to take a flock of sheep across London Bridge at no charge. Livery companies are governed by a master (alternatively styled prime warden in some companies, or Upper Bailiff of the Weavers' Company), a number of wardens (holding various titles such as the upper, middle, lower, or renter wardens), and a court of assistants (board of directors), responsible for company business and electing its master and wardens. The clerk to the company is invariably its most senior permanent member of staff, who as chief executive officer runs its day-to-day activities. Membership generally falls into two categories: freemen and liverymen. One may become a freeman, or acquire the "freedom of the company", upon fulfilling certain criteria: traditionally, by "patrimony", if either parent were a liveryman of the company; by "servitude", if one has served a requisite number of years as an apprentice to a senior company member; or by "redemption", upon paying a fee. Most livery companies reserve the right to admit distinguished people, particularly in their sphere of influence, as honorary freemen. Freemen may advance to become liverymen, after obtaining the freedom of the City of London, and with their court of assistants' approval. Only liverymen are eligible to vote in the annual election of the Lord Mayor of London, the sheriffs and various other City civic offices, including the Ale Conners and Bridge Masters. Freemen are expected to advance to become liverymen by a vote of the court of the company. Liverymen no longer have any local authority franchise in the City, but retain the exclusive right of voting in the election of the Lord Mayor of the City of London (Michaelmas 'Common Hall' 29 September) and for the sheriffs (Mid-Summer 'Common Hall' 24 June) held in Guildhall as a ceremonial occasion. The votes are made by 'acclamation' subject to a challenge/demand from the floor for a ballot which would be held a week later. Any two liverymen may nominate a candidate for the Freedom of the City. Before the Reform Act 1832 the liverymen had the exclusive right to elect the four Members of Parliament representing the City. Between 1832 and 1918 being a liveryman was one of a number of possible franchises which could qualify a parliamentary elector in the City of London constituency, as it was a preserved ancient borough franchise under the terms of the 1832 Act. See also City of London (elections to the Parliament of England) for further details of the history of the involvement of liverymen in parliamentary elections. Today 39 out of 110 City livery companies own premises in London, as well as the Watermen and Lightermen which although not strictly a livery company, retains headquarters still in regular use. Among the earliest companies known to have had halls are the Merchant Taylors and Goldsmiths in the 14th century, and, uniquely, the kitchen and the crypt of Merchant Taylors' Hall survived both the Great Fire of London and the Blitz, the kitchen now having been in uninterrupted use for over 600 years. Besides surviving parts of Merchant Taylors’ Hall, the oldest hall interiors now extant are those of the Worshipful Society of Apothecaries, dating from 1668-71; significant portions of the fabric of this building are also medieval, from the 13th-century priory part of which became the Apothecaries’ Hall. Several companies that do not have a hall of their own share office premises within the hall of another company on a semi-permanent basis, examples being the Spectacle Makers' Company, which uses part of Apothecaries' Hall, and the Worshipful Company of Shipwrights, which co-habits with the Ironmongers. Many livery halls can be hired for business and social functions, and are popular for weddings, commercial and society meetings, luncheons and dinners. Three livery companies (the Glaziers and Painters of Glass, Launderers, and Scientific Instrument Makers) share a hall in Southwark, just south of and outside the City of London, while the Worshipful Company of Gunmakers has long been based at Proof House, in the London Borough of Tower Hamlets and the Master Mariners' "hall" is an historical ship, HQS Wellington, moored on the Thames which is shared by the Scriveners' Company. Companies without halls customarily book use of another livery hall for their formal gatherings, giving members and guests the opportunity to visit and enjoy different City livery halls by rotation. Blue plaques throughout the City of London indicate where companies formerly had halls. Whilst several livery companies may aspire to owning or regaining their own hall it is appreciated that any increase in the overall number of livery halls would inevitably lead to some dilution of use of the existing halls. There is also attraction in belonging to a company which is peripatetic. In 1515, the Court of Aldermen of the City of London settled an order of precedence for the 48 livery companies then in existence, based on those companies' contemporary economic or political power. The 12 highest-ranked companies remain known as the Great Twelve City Livery Companies. 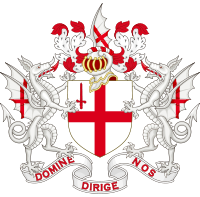 Today there are 110 City livery companies, all post-1515 companies being ranked by seniority of creation. The Merchant Taylors and the Skinners have long disputed their precedence, so once a year (at Easter) they swap between sixth and seventh places. This mix-up is a favourite theory for the origin of the phrase "at sixes and sevens", as has been pointed out by at least one Master Merchant Taylor; however, it is possible that the phrase may have been coined before these two companies (Taylors and Skinners) resolved their dispute, which arose from their both receiving Charters in 1327 with no proof surviving as to which was granted first. Neither the Company of Parish Clerks nor the Company of Watermen have applied or intend to apply for livery status, which remains a long-standing City tradition. This is granted by the City Corporation in effect to control a company. The Watermen and Parish Clerks are governed by statutes and Royal Charters with responsibilities outside the City. The Company of Watermen and Lightermen was established by Act of Parliament in 1555 to regulate the watermen on the River Thames responsible for the movement of goods and passengers and remains the only ancient City Guild to be formed and governed by Act of Parliament. They are then strictly not 'Companies without Livery' at all but simply 'companies'. The City Corporation of London remains lord of three manors at Southwark (Guildable, King's and Great Liberty). These are membership organisations for those areas which are the jurors of their manorial courts. They are not in any way Guilds as are not related to trading and occupational activities. These courts retain legal-standing under the Administration of Justice Act 1977. ^ "Alphabetical list". City of London. Archived from the original on 18 April 2012. ^ a b c d e f g h i Engel, Matthew. "British institutions: livery companies". ft.com. Retrieved 22 December 2012. ^ a b "The Worshipful Company of Bowyers". www.bowyers.com. Retrieved 21 January 2018. ^ Ltd, ATG Media. "The Worshipful Company of Arts Scholars". www.artsscholars.org. Retrieved 21 January 2018. ^ a b c "Livery companies". City of London. ^ "Livery Company Affiliations with the Armed Forces (Regular and Reserve)". Stepping Forward London. ^ "Mary Berry leads flock of sheep over London Bridge to promote wool industry - Farming UK News". www.farminguk.com. Retrieved 21 January 2018. ^ "Livery Committee". City of London. Retrieved 12 March 2015. ^ "Livery Committee". Livery Companies of the City of London. Nigel Pullman. Retrieved 12 March 2015. Robert Seymour (1735). "Twelve Principal Companies of the City of London". Survey of the Cities of London and Westminster. 2. London: J. Read. Thomas Allen; Thomas Wright (1839). "Companies of the City of London". History and Antiquities of London, Westminster, Southwark, and Parts Adjacent. London. Edward Mayer and Donald Adamson, The Curriers’ Company: A Modern History, 2000. Wikimedia Commons has media related to Livery Companies in the City of London.